One of the most common engagements I do is working with firms in and around the NYC startup sector. I evaluate AWS infrastructures & applications built in the Amazon cloud. Join 32,000 others and follow Sean Hull on twitter @hullsean. I’ve seen some patterns in customers usage of Amazon. Below is a laundry list of the most important ones. On our products & pricing page you can see more detail including how we perform a performance review and a sample executive summary. 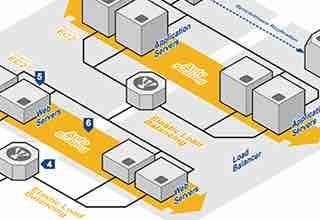 When you first start using Amazon Web Services to host your application, you like many before you may think of it like you’re old school hosting. Setup a machine, configure it, get your code running. The traditional model of systems administration. It’s fine for a single server, but if you’re managing a more complex deploy with continuous integration, or want to be resilient to regular server failures you need to do more. Enter the various automation tools on offer. The simplest of the three is Elastic Beanstalk. If you’re using a very standard stack & don’t need a lot of customizations, this may well work for you. With more complex deployments you’ll likely want to look at Opsworks Sounds familiar? That’s because it *is* Opscode Chef. Everything you can do with Chef & all the templates out there will work with Amazon’s offering. Let AWS manage your templates & make sure your servers are in the right state, just like hosted chef. If you want to get down to the assembly language layer of infrastructure in Amazon, you’ll eventually be dealing with CloudFormation. This is JSON code which defines everything, from a server with an attached EBS volume, to a VPC with security rules, IAM users & everything inbetween. It is ultimately what these other services utilize under the hood. Also: Is Amazon too big to fail? Amazon has a few cool tools to help you manage your infrastructure better. One is called Trusted Advisor . This helps you by looking at your aws usage for best practices. Cost, performance, security & high availability are the big focal points. In order to make best use of alerts, you’ll want to do a few things. First define an auto scaling group. Even if you don’t want to use autoscaling, putting your instance into one allows amazon to do the monitoring you’ll want. Next you’ll want to analyze your CloudWatch metrics for usage patterns. Notice a spike, could be a job that is running, or it could be a seasonal traffic spike that you need to manage. Once you have some ideas here, you can set alerts around normal & problematic usage patterns. Related: Are we fast approaching cloud-mageddon? If you haven’t already done so, you’ll want to enable multi-factor authentication on your AWS account. This provides much more security than a password (even a sufficiently long one) can ever do. You can use Google authenticator to generate the mfa codes and associated it with your smartphone. While you’re at it, you’ll want to create at least one alternate IAM account so you’re not logging in through the root AWS account. This adds a layer of security to your infrastructure. Consider creating an account for your command line tools to spinup components in the cloud. You can also use MFA for your command line SSH logins. This is also recommended & not terribly hard to setup. Amazon offers Virtual Private Cloud which allows you to create virtual networks within the Amazon cloud. Set your own ip address range, create route tables, gateways, subnets & control security settings. There is another interesting offering called VPC peering. Previously, if you wanted to route between two VPCs or across the internet to your office network, you’d have to run a box within your VPC to do the networking. This became a single point of failure, and also had to be administered. With VPC peering, Amazon can do this at the virtualization layer, without extra cost, without single point of failure & without overhead. You can even use VPC peering to network between two AWS accounts. Cool stuff! Also: Are SQL databases dead? I worked with one startup that had been founded in 2010. They had initially built their infrastructure on AWS so they chose instances based on what was available at the time. Those were m1.large & m1.xlarge. A smart choice at the time, but oh how things evolve in the amazon world. Now those instance types are “previous generation”. Newer instances offer SSD, more CPU & better I/O for roughly the same price. If you’re in this position, be sure to evaluate upgrading your instances. If you’re on Amazon RDS, you may not be able to get to the newer instance sizes until you upgrade your database. Does upgrading MySQL involve much more downtime on Amazon RDS? In my experience it surely does. Along with instance sizes, you’ll also want to evaluate disk I/O options. By default instances in amazon being multi-tenant, use disk as a shared resource. So they’ll see it go up & down dramatically. This can kill database performance & can be painful. There are expensive solutions. Consider looking at provisioned IOPS and additional SSD storage. Also: Is the difference between dev & ops a four-letter word?